ETHLend is a very young coin, it just ended its ICO. ETHLend offers a decentralised lending solution. For example, instead of selling some of your Ether to participate in an ICO, you could just borrow the required ETH from ETHLend and pay it back after you collect your profits. Another scenario could be to borrow funds needed to invest in cryptocurrency mining. But you could also convert ETH into fiat to finance real world needs. The goal is to offer a global solution, not restricted by local regulations or national differences in interest rates. Today the inflation-adjusted interest rate in different countries varies based on the available liquidity. In high liquidity market, Europe, interest rates are between 0.5-5 percent, in Russia 12-15 percent, in India 12 percent and in Brazil 32 percent. This shows a clear inequality in the way acces to the lending market is distributed. We believe that this inequality between the borrowers should be flattened. I think this can help a lot of people. I've been lending out money in the form of microloans using [Kiva] (https://www.kiva.org/) for years already. And I've never had someone failing to pay back. ETHLend will be fueled by ERC-20 compatible tokens that are used as a collateral to secure loans. When a token has value, the token can be pledged to secure the repayment of the loan. In the initial phase, this model will be mainly restricted to the cryptocurrency world because we haven't reached the stage yet where many real world assets can be tokenized. But If the cryptocurrency evolution really gets a grip on everyday life, this could be a feasible scenario. You could for example tokenize a car and use it as collateral to get a car loan via ETHLend. 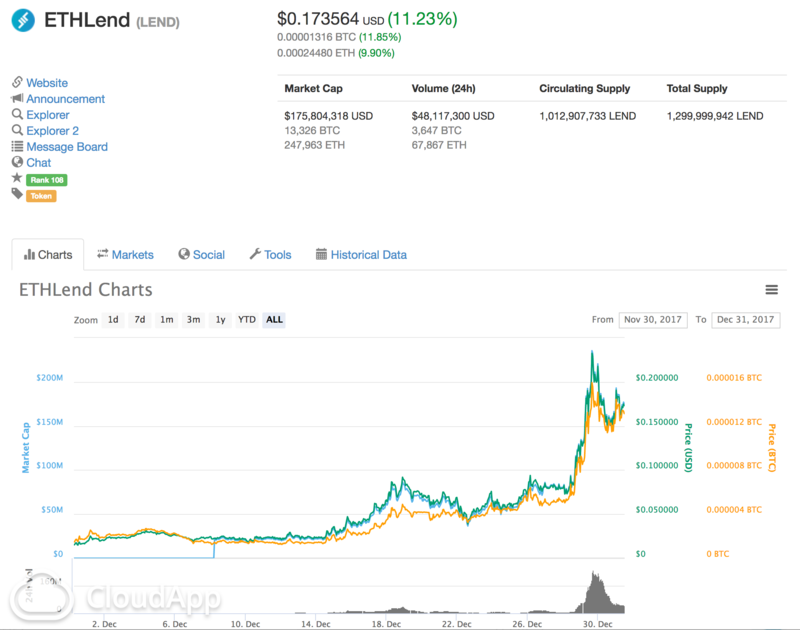 Given the success of SALT, ETHLend coin could grow a lot in value over the coming months. But I also see a lot of value in borrowing ETH to participate in ICO's. Often, ICO's have a minimum requirement to participate and can have huge returns. When your funds are spread over multiple altcoins assets, it's probably easier to borrow some ETH instead of having to convert all your ALTS in ETH to be able to participate in the ICO. ETHLend is a blockchain startup founded by Stani Kulechov. ETHLend aims to provide a global peer-to-peer lending market by using blockchain technology and smart contracts. Beyond local lending. ETHLend unfolds global lending by the use of cryptocurrency. Lenders and borrowers use Ethereum-native token Ether (ETH) for the loan transactions. By using Ether, the loan transactions are executed within seconds instead of days, which is a medium equivalent within the banking system on international transfers.